Pinterest is an electronic bulletin board where users can “pin” images. It is a place to organize and share online images that you find interesting or inspiring from around the web. These images are then categorized into various boards on the users’ profile. Pins are also shared and searchable, which makes Pinterest a wonderful resource for visual information. Well, that's the technical definiation anyway! What it really is a highly addictive new way to find and save interesting ideas--about just about anything you can imagine! Think of Pinterest like Diigo or Delicious but organized visually. Lesson Plans- Pinterest is a superb visual resource full of pictures, videos, and website links. You can search for pins with a specific theme or subject, i.e. “Periodic Table,” making it an ideal resource for teachers. The images that are pinned will lead you to the original source, where you may find more inspiration for your lesson plans. Pinterest also is a great resource for organizing lesson plans for future events or holidays. With Pinterest you can easily bookmark or “pin” lesson plans you come across the web for a later date. For instance, if you stumble upon a great resource for Earth Day, you can simply pin an image on the webpage and save it for a future date! Sharing ideas- Pinterest is a social networking site that emphasizes interacting through interests and ideas. This makes it a perfect platform for sharing ideas with those who have a similar profession, trade, or hobby. For educators, Pinterest can be a great way to collaborate with teachers, parents, and students. Clearly the easiest way to share ideas is by pinning resources that pertain to the classroom, however Pinterest can be very interactive and personal if you think outside the box! Not only can you get parents and students involved by pinning images of events happening in your own classroom, but you can set up boards that allow multiple people to pin! For example, you could create a board titled ‘World Events’ and setup the settings so multiple people can pin. Once created, instruct your students to pin an image or article about any current event! Take your pinning to the next level! 1. Get the Button: To pin on Pinterest, you need the "Pin It" button on your web browser's toolbar. It's so simple to get it. Go to the "About" pulldown menu in the top navigation bar and select "Pin It Button" and then just follow the direction (in a nutshell: drag it to your navigation bar and drop it there). 2. Get Pinning: Whenever you see something you want to save for future reference, such as an image, blog post, video or article, click the "Pin It" button in your tool bar and then select the image to pin. You should also include a brief description of what you are pinning so you know why it's there. 3. Follow and Repin: You'll also want to follow folks who have similar interests. When you do this, you get to see what they are pinning and have the opportunity to repin it (basically add it one of your pin boards). It's a great way to get ideas from others that you might not have been clued into otherwise. Use keywords in your descriptions. A lot of people leave inane descriptions ("Cute!") on their pins. (I'm guilty!!) However, keyword-rich descriptions will help get pins and boards found more easily via search. Great for all of us! Write your own summary description. Don't copy and paste the whole post, the whole recipe or all the instructions from the original post directly in your pin. Not only does it clutter the images with unnecessary text, it's not good Pinterest manners. Plus, posts are copyrighted so pasting them in their entirety is copyright infringement. Edit your pins. If you need to edit a pin, hover over it and click on the "Edit" button that appears. If you need to find the pin first, hover over your name in the top right of your screen, click on the "Pins" link in the dropdown menu. This will show you all your pins listed by the most recent. If it's an older pin, click on the "Boards" link while hovering over your name and then you can find your pin by topic. Pin from the individual post, not the home page. When you're pinning, make sure you are pinning from the individual post, not the home page. (To get to the individual post, click on the post title. If you can see comments at the bottom, it's a sign you're on the individual post.) There's nothing more frustrating than clicking through a pin, only to realize the post with that image has long been pushed off the home page. Be kind and play by the rules. Know and understand the friendly guidelines Pinterest has put in place for its site. Tag people in pins. Simply add the "@" sign to your descriptions to tag someone so they know you were talkin' about them. Space out your pins instead of flooding the stream. If you're pinning a lot of stuff at once, you can overwhelm your followers. For example, if you're researching black shoes and spend an hour pinning a gazillion pairs of black shoes to your "Rockin' Black Shoes" board, anyone who follows you will just see a sea of black shoes in their stream. (I'm guilty of flooding the stream.) Instead, spread it out a bit. Organize your boards well. If your boards are clean and organized, you'll get more followers than if everything is hodge podge and there's no rhyme or reason to your pinning. Vague board titles aren't so helpful either. Take the extra time to see if a pin is a good one. Have you ever clicked through a pin only to discover that it leads nowhere? Frustrating, isn't it? So, before you repin, make sure you check it out first. Use "Like" as a pending place. Sometimes when I don't have time to 'investigate' a pin to see if it is a good one, I'll just 'Like' it. Then I can go back to my likes when I have time and look into them a little further." Follow individual boards to cut out the noise. One of the nice things about Pinterest is that you can follow individual boards. You don't have to follow a person and therefore, all of their boards (although you can do that too). To subscribe to individual boards, simply click on the name of any Pinterest user and you'll see all their boards. If you follow the person, you'll follow all their boards. Otherwise, just pick and choose the boards you want. Find people and boards to follow by reverse rabbit trailing. That is, when you see a pin or a board you like, click on the person it came from. Or click on the original source. I've found a lot of good boards to follow that way. Hop on the "Everthing" page every once in a while. 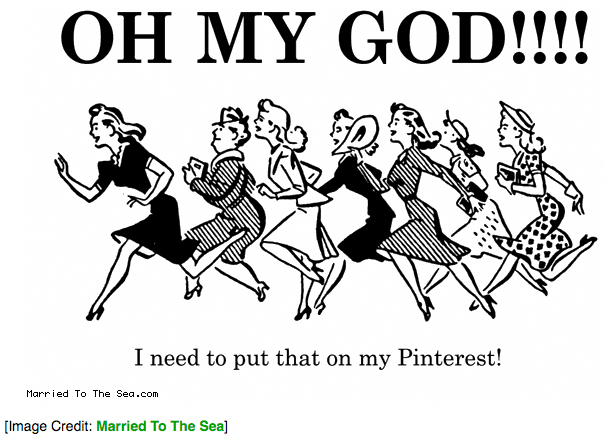 When you log into Pinterest, you'll only see the boards you're following. To find some new boards to follow, click on the Everything link at the top of your screen to find new people. Or search by category. Categorize your pins. This will make your pins more easily found and will potentially result in more people following you. Don't just be a repinner. Be a pioneer pinner. In other words, don't just repin what others have already pinned. Always be on the lookout for new pins that no one else has found. If you're like me, you see a lot of the same pins come through. I pay attention, though, when I see something fresh and new. I'm much more likely to follow that person too. Don't forget the iPhone app to use Pinterest on the go. Find them on the goodies page or in the app store. Automatically populate a pin description. If you're on a site and you want to pin something, you can highlight a portion of text before clicking the "Pin It" bookmarklet. The text you highlight will automatically populate your description. I like to add quotation marks when I quote directly and only do a small snippet. You always want people to be directed back to the original site for the main content. Note the 500 character limit on your descriptions.